Phoenix saw a huge crowd on its street on the occasion of Martin Luther King Jr. Day, which had been the epitome of equality and a sign of fight against the color discrimination and racism. Among the crowd, there was an old person who was teaching his great-great-grandchildren the importance of civil rights in the nation and the importance of the person who had implemented civil rights possible in the United States. David Williams, the senior with his great-great-grandchildren, said he had been attending this march from the very start and now the march is three generations old. Looking at the crowd, David said that the crowd had become so diversified that it is not limited to only fighting prejudice against African-Americans alone but has become a unifying moment for the people about all backgrounds. The demonstration which covered almost every street of Phoenix started with a prayer near Pilgrim Rest Baptist Church on Jefferson and 14th streets at about 9 a.m. As the demonstration marched forward, the group grew to thousands. Some people talked about the change since King led the nation in civil-rights protests for equality, economic and social justice and an end to segregation. And some talked about the renewed heights of racism and prejudice amid a divisive political climate. And gathering much attention of the nation’s political enthusiasts, Sen. Kamala Harris, a California Democrat, declared on this MLK day that she would be contesting for Presidency in 2020 to fight against the injustices done by the incumbent. It should be reported here that Harris is the second black woman to serve in the Senate. President Trump laid a wreath at the Martin Luther King Jr. Memorial in Washington, D.C. honoring the King. At the same march, there were lots of people from different sections showing solidarity with the great cause as well. Barry Smith, a retired Mesa school teacher, held a hand-made, cardboard sign that showed, “Old white men against bigotry.” He said he has been teaching his kids to go out and change if they don’t like something. He had been a protestor of President Trump’s alleged racism, and he said the march was the perfect place for him to be. He added that the march reminds him that the whole nation has not gone crazy on the influence of President Trump. It reminded him that there are still wonderful people who agree on the idea that the country is on the wrong way and it needs to be checked as soon as possible. King’s famous speech “I have a Dream” was continuously being played in the march followed by music and cheers from the crowd. Social media also saw the sharing of King’s quotes and his “Letter from Birmingham Jail,” which the civil-rights icon penned about five years before his assassination. Phoenix is not the only place where rallies of this kind were held; similar rallied were held all over the valley. Maricopa County Recorder Adrian Fontes said that the demonstration was the continuation of King’s dream. Fontes added this is all about American values. It is all about equal justice under the law, and that’s really across the board what we have been looking for. Sen. Martha McSally and Rep. Ruben Gallego are among other politicians who moved to the front to hold the ceremonial torch in the march. While some in the march talked about the past repressions, some talked about recent police discrimination on the people of color. Valley Resident Katt Mckinney talked about 19 years old boy Jacob Harris, who was shot dead by officers in an alleged robbery case. Katt said that she was overwhelmed to see the crowd and she wanted to make sure that everyone is aware of why they are here. 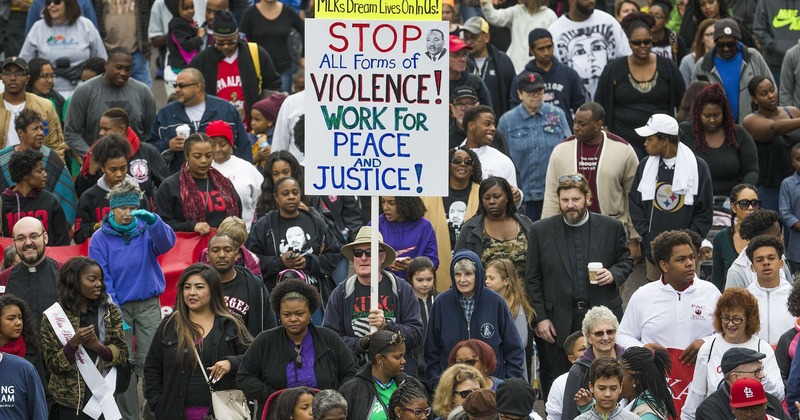 The march ended at Phoenix’s Margaret T. Hance Park, about two and a half miles and roughly an hour and thirty minutes after commencing at from Pilgrim Rest Baptist Church. In a final note, McSally said King’s legacy has been helping the country to stay intact in the divided times. People in the United States have different views and having even dissent the whole nation is moving united.